What’s the next big idea at GIE+Expo? Last year we received a great response from our article detailing the next three ‘big ideas’ from Spectrum Technologies, Inc. So this year, I’m bringing it back. But instead of three ideas from one company, why not a handful of ideas from one trade show? 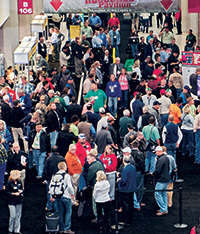 Enter last month’s GIE+Expo in Louisville, Ky. The GIE+Expo drew 19,000 attendees to its biggest show ever — 1.3 million square feet, or the size of 23 football fields. Unfortunately, the golf industry isn’t seeing the same boom with it’s big annual trade show, the Golf Industry Show, but maybe the GIE+Expo’s numbers are a sign that things are slowly turning around. Meanwhile, if you ever have a chance, GIE+Expo is worth checking out. Always held in late October, there are a lot of cool toys, with many of the same vendors as the GIS, while including a bunch of companies you won’t find there, plus the ride and drive area is huge! 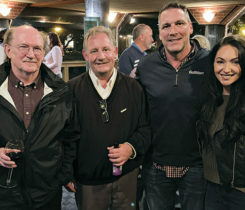 Also, our sister publication, Landscape Management, hosts one heck of a party at Goose Island in the 4th Street Live party district… where you’ll find more than a few golf folks, including yours truly. Come see us there next year. I love checking out new gadgets, and this is a snapshot of a few products I saw that might be interesting to you. Some of these you may roll your eyes at, but who knows, others might set off that light bulb. The Polaris outdoor demo area was packed, but I took the time to brave the line, and it was worth the wait. 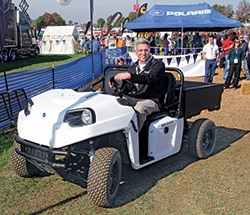 They gave me time on all six of the utility vehicles they had there, but two stood out for superintendents: the eM 1400 LSV and the eM 1400. 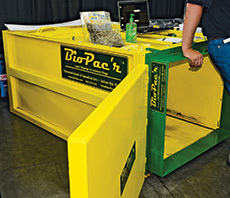 One of the busiest booths I saw was BioPac’r, right around the corner from the Landscape Management booth. It was one of those 10-foot-by-10-foot booths with only one product and one salesman, but it was never empty. Maybe that’s because Todd Graus, the inventor of the BioPac’r, has a machine that offers grounds managers an alternative way of making money. How? By selling grass clippings to farmers. The BioPac’r, while complicated to spell, is simple in function. It takes grass clippings, compresses them, and pushes the compressed block of clippings into a bag. One man’s trash is another man’s treasure. The resulting silage is valuable to farmers and dairy operators. My big but is this: is golf turf safe for livestock? According to Graus, once the clippings go through the silage process and cook for 14 to 28 days, it’s good to go. He has further research available on his website, biopacr.com. I brought this idea up with Cole Thompson, Ph.D., at Cal Poly State University, while we were discussing his research story in this month’s issue (check it out on page 35.) He had never heard of this being done on a golf course before, but he found the idea intriguing, especially for courses who are already bagging clippings from some areas. From cooking clippings for cash to freezing weeds to death — how’s that for a segue? The concept of the Frostbite is also simple. Take a canister of CO2 and attach a blower to it. Then walk around and freeze weeds to death. No mess, all natural, with results in a matter of hours. The product has been available for six months, and according to Rick Howerton, COO of the company, was doing well at the GIE+Expo show. They were selling the Frosbite for $499 as a show special, with a regular price of $599. 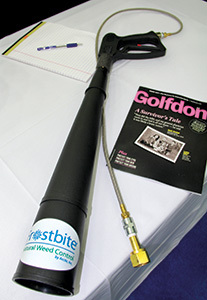 He plans on exhibiting at the Golf Industry Show in San Antonio in February 2015. Howerton says a half-second burst on the undesirable weed will do the trick. With a common 20-pound CO2 canister, a user can get 600 to 800 bursts. For more information, visit frostkills.com. Hydretain has been around since the 1990s, but they’re still hard at work getting their message out. Hydretain is a liquid group of hygroscopic and humectant components that attract water like “tiny water magnets” and make available to plant roots microscopic moisture that would otherwise be lost to evaporation. “We want superintendents to know that there is water conservation technology available that is quite different than wetting agents or super-absorbent polymers, (and) that have the ability to go down as a liquid or granular, and dramatically reduce watering,” says Rick Irwin, president, Ecologel Solutions. A recent success that caught my ear was the University of Texas Golf Club, which, according to the superintendent, cut their watering by a third, thanks to the technology. And as we all know… it gets hot down there in Austin. Another benefit: according to Irwin, it’s great before tournament play, because you can still allow the course to dry out to increase green speed, while maintaining color longer and accelerating recovery afterwards. You can learn more by visiting them at the GIS, or click over to hydretain.com. From a product that acts like a water magnet… to a product that burns water. Today, I’m the segue king. K100 is another product that isn’t new, but it’s getting a push right now in the lawncare and golf markets, and according to Loretto Thompson, vice president of sales and marketing, they will be at the GIS in San Antonio to pitch to superintendents. Thompson says the product, which comes in various formulations, has been catching on with universities. For more information, visit k-100.com. I only had room for five products, but the GIE+Expo had lots more. 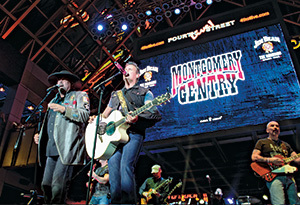 You’ve got to be there in person to eyewitness all 750 booths, 19 acres of demo area and the free concert from Montgomery Gentry, though. If you were at the GIE+Expo and we missed you (string trimmer company I stopped by for an interview three different times; I’m looking at you) we’ll catch you next year, but in the meantime, we’ll continue to run cool products in our Professional Grade section.